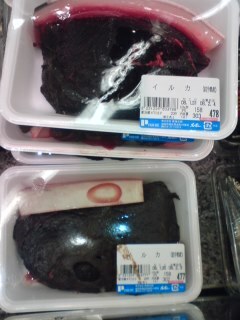 When I visited Parche Food Market inside Shizuoka JR Station to buy ingredients for dinner (my better/worse half having “ordered” a seafood Gratin), I thought I might as well as take a couple of picks to prove that whale meat is ordinary fare down here. 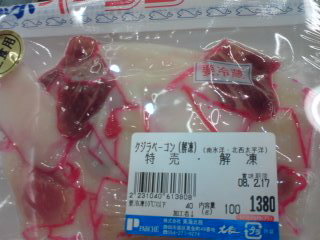 The whale meat had already gone, but whale bacon was still available. 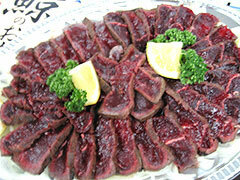 Plenty of dolphin meat was avalaible. This particularly came from Gunma Prefecture. Being an avid lover of all things meaty, I do recognise the Titanic impact on the environment that live stock has. Having said that, I will not stop eating meat. However, if whale meat has almost no carbon footprint, why is the west not embracing this high protien, mass abundant source of meat. I do feel that the televised sea shepherd program might have something to do with it. Unfortunately, we live in a capitalist world where money rules. What can you do? 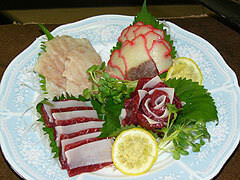 Whale sashimi is great! Let’s manage it, not bannning it. I respect a culture wanting to preserve its heritage; however, the subject of whaling is not as simple as Western prejudice. There is a genuine concern over the quantities of mercury accumulated in its flesh…one reason many school have pulled dolphin meat from its menus. Also, there is a lack of unbiased (from both the pro and anti whalers) regulation and conservation of the practice. Lastly, some find the actual hunting methods cruel and less evolved than modern slaughtering practices…even that of deer which good hunters will try to bring down quickly. I don’t begrudge anyone from eating their choice of animal. 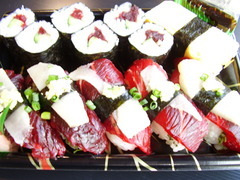 However, I do believe that (as with ALL animal processing venues…with the exception being Kobe beef which, let’s face it, live a pampered life) improvements should be made and every precaution taken to guarantee a safe product, humane kill, and conservation. Way to go Robert! It’s especially an emotional debate here in Australia. 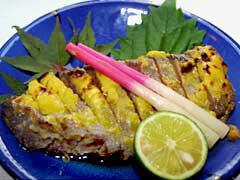 I understand that 1) the catching is only done in regulation only utilizing the meat of the not endangered species. 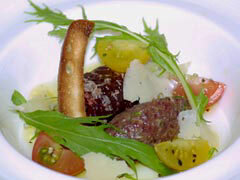 2) That eating whale is so much of a less carbon foot print than beef for example. 3) that Australia unilaterally claims that some Antactic waters are theirs based on self declared rights of occupying a part of Antarctica and thus according to Australian law (not international law) whaling by Japanese is illegal in those waters. 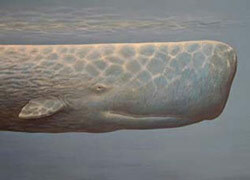 I don’t really love the taste of whales but just thinking logically without emotion, it seems like there’s nothing wrong with it. Thanks for the objective comments!